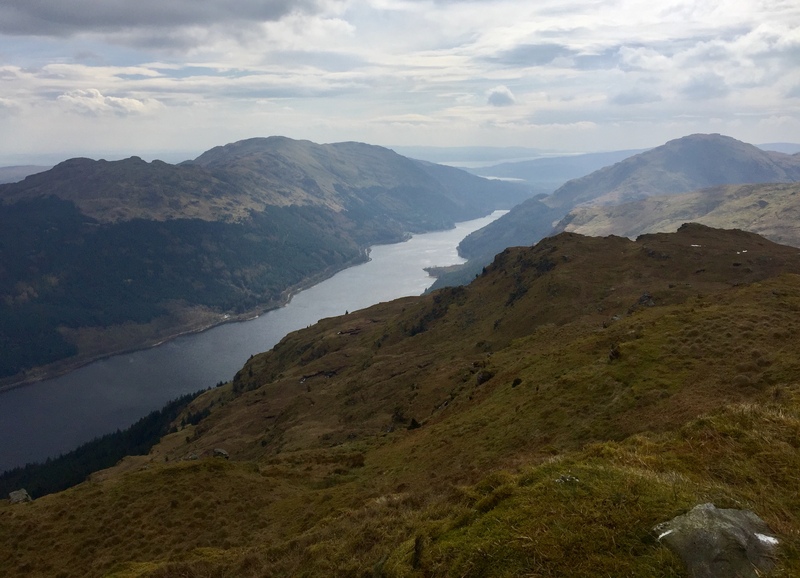 THE rugged hills of Cowal have a degree of roughness that elevates the seriousness of the ascent to a greater level than height alone would suggest. Sheets of impenetrable forestry, slopes abounding with crags, outcrops and steep gullies, long stretches of tussocks and strength-sapping bog; easy strolls are hard to find. I was a regular visitor here during days of working in the west, but the intervening time gap had glossed over the rigours of those outings. Reaquaintance has provided a few eye-opening moments. All the way down the length of Loch Eck the eyes are drawn to the 13km long ridge on the western shore which runs from Glenbranter to Benmore Gardens. 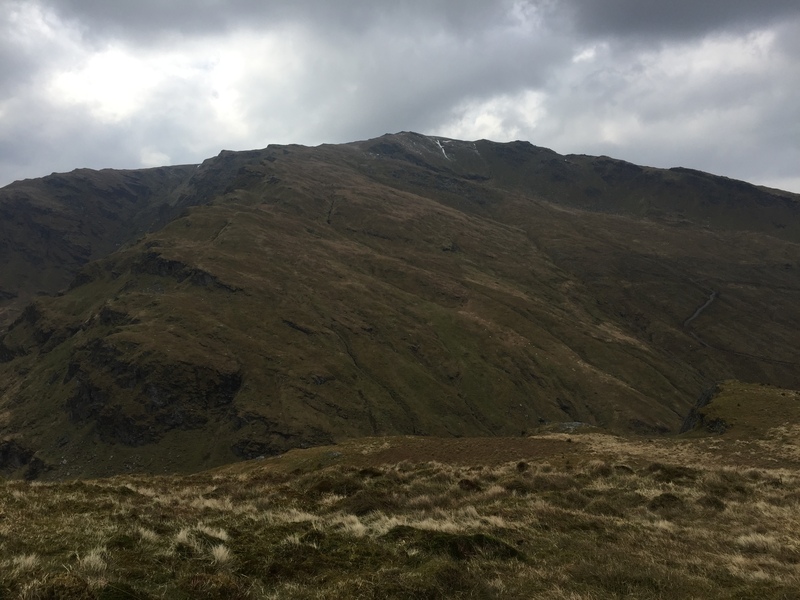 There are several ways to tackle the two main peaks, Beinn Bheag and Beinn Mhor, on this ridge, each with its own set of challenges. The clear weather I had been waiting for had arrived, albeit with a fierce, chill easterly wind. Still, I would be walking the early part of the day along a track on the shore of the loch and then the initial ascent would be with the wind behind me. Winter gear again, including the heavyweight boots. I like the snows but, like so many others, I've had my fill for this year. Now I'm just looking forward to casting off the leaden footwear until it rolls around again at year's end. Four miles of tree cover, filled with noisy birdsong and new life. The trees nearer the water were mostly skeletal, a breeding ground for triumphant moss and lichens, a creeping subjugation which included the scattered boulders. I rose above the forestry and started up a mixed gully by a tumbling stream, all deep grasses, thorny branches, hidden boulders and rusted fencing, to reach a boggy bealach. The climb up Beinn Bheag was steep at first, then it was all about dodging round huge rocky lumps, constantly trying to find the easiest line onward. The visibility meant it was straightforward, but I kept thinking it would be an entirely different prospect in mist. 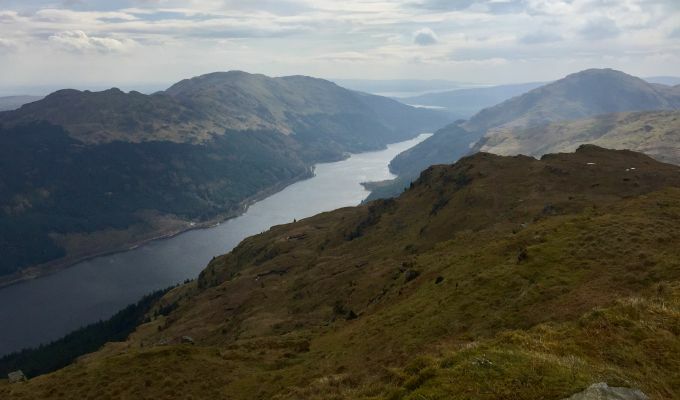 The summit cairn is merely a few rocks in danger of being engulfed by the surrounding grass, but the view down Loch Eck invites superlatives. It would have been a spot to linger if the wind hadn't been so busy trying to deposit me down into the grey waters far below. Beinn Mhor is the much bigger sibling, but the ascent is simple from the shared col and I was soon trying to stand up at the trig point which marks the highest spot for miles. Now it was simply a case of following the long ridge south-west to drop back into the trees. This proved harder work than I had imagined. Beinn Mhor's influence is convoluted, its coverage vast. There's a lot of up and down, and a few necessary detours. First there's a long pull over boggy ground to Capull Cloiche. Then the rollercoaster picks up, over Creachans Mor and Beag. Craggy Clach Bheinn sat proudly out to the east, a tempting prospect, and I toyed with the idea of heading out there, but the wind had gone into reverse from the forecast, now strengthening rather than weakening. It was tiring work. Instead, I carried on to an unnamed summit ringed by vertical drops, which demanded a careful reversal of route to get back on the right track. I was walking in italic fashion as I crossed the final grassy hump of A' Chreach. The gusts were at their strongest as I followed the rusted fence posts down to the treeline and the relief of a gentle track which meandered through light and shade and around the bounds of the botanic gardens to reach the incoming road. My feet were tender, my legs weary, but my body was satisfied. The wind had certainly added a extra factor to the exertions of the day. I've had my fill of the Cowal hills for now, but I was glad I had saved the best for last. I will be back again, probably when the rose-tinted glasses have been applied.